In 1818 William Payne attended a hearing before two Justices of the Peace to determine whether or not he was entitled through settlement to receive parish relief from the Holy Trinity overseers of the poor. If not, then he would be removed to the appropriate parish. In earlier years this could have happened to any new arrivals in a parish living in accommodation worth less than £10 per annum, so long as they were challenged within 40 days. They didn't need to be claiming relief at the time; only suspected of perhaps needing it in the future; however, an Act of 1795 specified that removal should only take place if and when a person became chargeable to the parish. The account of William's evidence begins with standard legalese before he explains the circumstances that he hopes will justify his claim for settlement. The key considerations were whether he was born in the parish and if so, whether he had served an apprenticeship or worked for more than a year in a different parish: This would be an easy trap to fall into in a small town of three parishes. The transcript below reveals some useful family details as well as giving an insight into William's life at the time. The transcription may contain an error or two where a word is unclear and I have added a little punctuation and clarified the notation for "old money". Hopefully the meaning is unchanged. 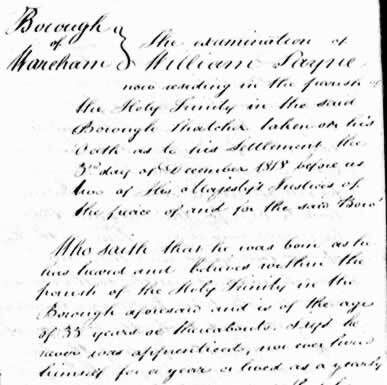 The examination of William Payne now residing in the parish of the Holy Trinity in the said Borough, thatcher, taken on his oath as to his settlement the 3rd day of December 1818 before us two of His Majesty's Justices of the Peace of and for the said Borough. Who saith that he was born as he has heard and believes within the parish of the Holy Trinity in the Borough aforesaid and is of the age of 35 years or thereabouts. Says he never was apprenticed, nor ever lived himself for a year or lived as a yearly servant with any person. That he lived with his father in Trinity parish and learned the business of a thatcher till about 16 years ago when he married Grace his present wife by whom he has seven children now living, viz. Eliza aged about 15 years, John about 11, George about ten, Elizabeth about nine, Mary Ann about eight, William about four and James about two years. Says he lived with his father about a year after his marriage agreeing to pay him 50s a year for his lodging. He then took a house on Martins parish of Mr Hayward at five Guineas a year in which he lived about nine months and then went back again to his father's house agreeing to give him as before 50s a year for their lodging in which house he and his family have lived to the present time. That about the year 1812 having a Bill on John Calcraft Esq. (who was the owner of the house in which his father lived and where Examinant lodged) for thatching work done, he carried in the Bill to Mr Bartlett, Mr Calcraft's steward, to be paid amounting to £19: 6s: 2d and Mr Bartlett or his clerk told Examinant that as his father had not paid the rent of late and there was then four years due, and as Examinant did the thatching work for Mr Calcraft he should in future look to him for the rent and that he should now charge him with two of the four years rent then due which was as much as the balance could enable him to charge, to which he agreed and took the balance of the account after paying the two years rent amounting to 16s and since that time he has paid no rent nor come to any settlement though he has continued to do the thatching work for Mr Calcraft and has been frequently asked for his accounts. That at the time of the above settlement with Mr Bartlett he ceased to pay the lodging money to his father which he had regularly done up to that time, telling his father that as Mr Bartlett had charged him with the rent he should not pay for lodging too. His father has been dead about two years. That about Christmas 1806 he took of Mr Robt Dugdale a garden called the Folly Garden in Martins parish in Wareham at £4 per annum to commence from Christmas 1806 and has occupied the same for four years to Christmas 1810. That on 5th Sept 1810 Mr Bacon offered to let him a house which adjoins Examinant's father's house in Trinity parish and Examinant took it for one year from that day at £4: 4s: 0d per annum and Mr Bacon gave him the key on that or the following day. That Examinant did not occupy the house himself except to put some potatoes there which grew in the Garden he rented of Mr Dugdale and some wood faggotts spars etc. which he sold. That at Michaelmas Dairyman Stickland took the house at £4: 10s: 0d a year till he could get another, Examinant reserving to himself the pantry and the garrett if he needed it to keep potatoes. That Dairyman Stickland occupied it half a year till Lady Day 1811 and a week or two after Mr Bacon sent a man of the name of White to Examinant and White asked Examinant to give up the house to him at Mr Bacon's request which Examinant agreed to do as he did not want it and held himself no longer tenant of Bacon's. And Examinant says he has done no act or thing to gain a Settlement except as before stated. And that his late father William Payne was settled as he has heard and believes at Dewlish in this County, he having been about 4 or 5 years ago removed by an order of two magistrates from the Borough of Wareham to Dewlish. So far I have found no mention of William Payne's father being born at Dewlish, a small village about ten miles northwest of Wareham. He died in Wareham, aged 76, according to the parish records, so he would have been born about 1740. In which case the baptism for a William Pain on 1 November 1740 in the parish of Athelhampton with Burleston could refer to him. The church is only 4 or 5 miles from Dewlish and had apparently been repaired earlier in 1740. Perhaps that was the reason for Thomas and Mary Pain to choose it for their son William’s baptism rather than the local church at Dewlish which had seen the baptism of their daughter Elizabeth on 23 February 1738. Thomas Pain and Mary Chiles (Childes?) were married after Banns in another parish only a couple of miles from Dewlish, Milborne St Andrew, on 11 April 1737 so they certainly spread their custom around. If Thomas was a thatcher like his son and grandson perhaps he found work in the nearby villages and his small family travelled with him. Several other children of Thomas and Mary Pain were born over the next few years and all were baptised at Dewlish. But I am not yet convinced it is the same Mary, (or Thomas!) as all these baptisms also follow the marriage of Thomas Pain and Mary Harris at Dewlish in 1744. More research needed. It appears that the younger William was successful with his settlement examination as he and his family were still in Wareham many years later. He seems to have avoided pitfalls such as living too long in another parish: he was apparently only using the accommodation he rented for storing potatoes. He also appears to have paid his parish rates regularly. William was mentioned several times in the records for Lady St Mary parish, Wareham, when he was paid for thatching work, usually on Waterloo Buildings. This was a row of cottages on the west side of Mill Lane that were used to house the poor. William died in 1836, aged 52, but he wasn't the last thatcher in the family: George, William and another son, Stephen, born in 1820, all took up thatching as a trade. According to the census records, George was a thatcher in every census year from 1841 to 1881 when he was 73: a long hard outdoor working life with no pension to retire on. Stephen was listed as a thatcher in 1861 and 1871, after working as a servant when he was younger. William only appeared as a thatcher once, in 1851; in other census years he worked as a labourer, a pattern maker and a pedlar. 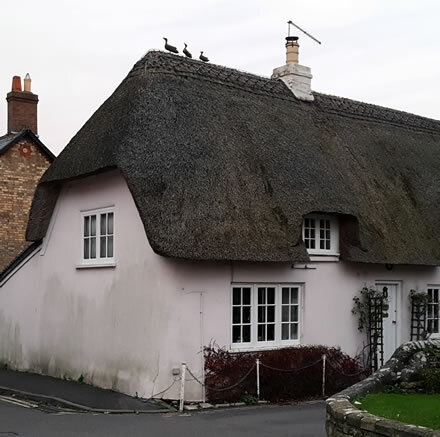 Thatch in Dorset apparently differs from that of other counties both in construction and appearance. A report compiled for Dorset County Council in the 1990's stated that one twelfth of all England's thatched houses were in Dorset. The writer doubted the accuracy of one thatcher's description of the Dorset style as being like poured custard but it seems to conjure the right image. Traditionally in Dorset a thatched roof is recoated, meaning that an old building may have 200 years or more of layers of thatch still intact. So if Waterloo Buildings were still thatched it would contain a layer worked on by William Payne and possibly his son George learning the trade. This cottage, complete with ducks on the ridge, is at the corner of Church Street and Church Lane in Wareham. In 1762, on 25 July, a fire broke out in South Street and over 140 buildings were destroyed. Afterwards no new thatched houses were allowed in the town.